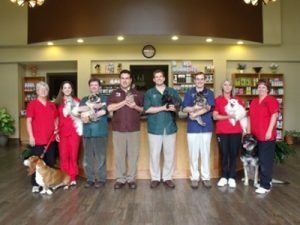 Crossroads Animal Hospital is Southern Veterinary Partners’ sixth location in Georgia. Southern Veterinary Partners (SVP) has hit hospitals 49 and 50 with its acquisitions of Tender Paws Animal Hospital in Conroe, Texas, and Crossroads Animal Hospital in Newnan, Ga.
Birmingham, Ala.-based SVP is veterinarian owned and operated and is the largest veterinary management company in the South, operating in 10 states. Tender Paws Animal Hospital is SVP’s fifth location in Texas; Crossroads Animal Hospital is its sixth location in Georgia. The company also was recently named a Top Tiger from Auburn University, recognizing the fastest growing companies by Auburn graduates, and to the Fast Track 30 by the Birmingham Business Journal, listing the 30 fastest-growing companies in Birmingham. SVP provides centralized support including marketing; human resources; finance, inventory, and purchasing management; and enhanced team member benefits. Hospitals retain their names, culture, and local community commitments as well as legacy veterinary professionals. Leveraging its infrastructure allows the hospitals in its network to focus on medicine and their patients to facilitate best-in-class veterinary services and exceptional client experiences, according to SVP. Visit svp.vet for more information.